Moving appliances from one home to another can be quite a challenge and requires a great deal of planning. Hereâs everything you need to know to make the transition as smooth and stress-free as possible! Relocating to a new home is always exciting but there are also plenty of challenges that you will face. Hiring a professional moving service can help streamline the process and eliminate any difficulties you may have. 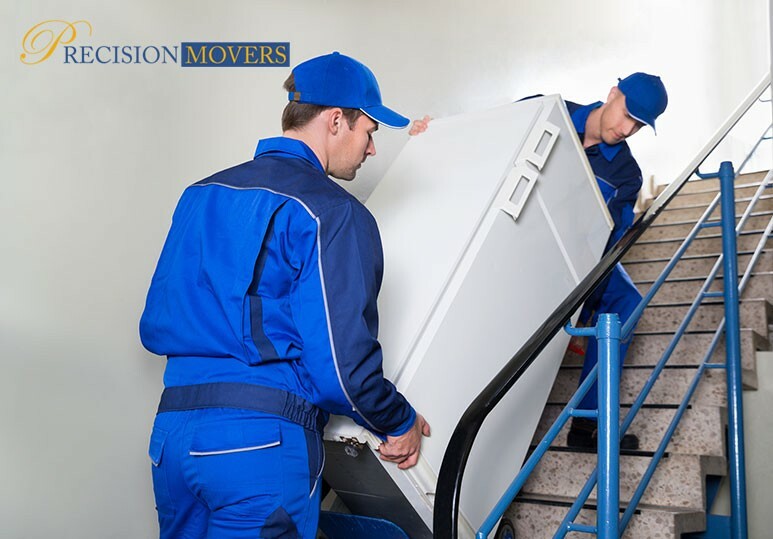 At Precision Movers, we have been successfully relocating Calgarians across Western Canada for over 30 years. From moving family heirlooms to packing up valuable appliances, our movers will ensure that all your belongings are transported safely, quickly, and seamlessly to your new home. If you are moving and want to take your appliances with you, a little planning will go a long way in mitigating any stress associated with the task. These following four tips will help you protect your floors, walls, and appliances themselves from damage and make your relocation much smoother! Regardless of how far you need to move your appliances, you need a clear path between its current location and its destination, so make sure to ALWAYS measure your appliances and carefully compare their dimensions to constricted spots along the way. What if they’re too big? In cases where some of your appliances are too big to get through the door, you may need to find an alternative route (taking the appliance through a larger frame such as a sliding glass door), or remove the door temporarily to get clearance. Cleaning your floors before you move appliances is one task that should NEVER be overlooked. Remember, there are certain objects that can damage your floors more than the appliances including dirt and stones. So always vacuum, sweep, or mop the area first. Once your floors are clean, you can put down a protective covering. AVOID cardboard as this has a tendency to move and create fiction, and can scratch your floors. Instead, consider investing in temporary flooring or left over runners to mitigate any potential damage. Once you have made sure that you are ready to move your appliances, you will need to prepare them. Fridge. Remove any food and drinks and place them in a portable cooler. Unplug the fridge and clean it, leaving the door open for AT LEAST 24 hours. Make sure to tape the door shut to prevent it from swinging open during the move. Stove. Turn off the power and remove any racks or surface grates and clean the exterior. Make sure to secure the knobs and tape or wrap the door shut. Dryer. Turn off the power, clean the lint screen and the exterior, and make sure to tape the door shut. Washing machine. Disconnect the power and the input/output hoses. Leave the door open for AT LEAST 24 hours to remove moisture and then secure the hoses to the unit. Make sure to tape the door shut. To find out more about our moving services, including how we can help you transport your valuable appliances, contact our Calgary movers at 403-540-4393 or fill in our online contact form.